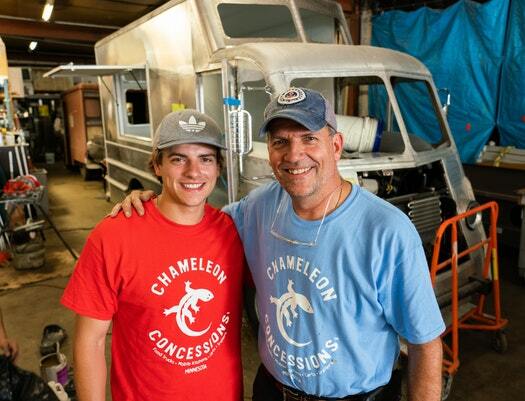 Mark Palm, owner of Minneapolis-based Chameleon Concessions, converted one of the Twin Cities area’s first food trucks, Simply Steve’s, in 2010 and has outfitted several hundred more since. His son Luke, left, works with him on college breaks.Although his is not exactly a household name, Mark Palm is the mastermind behind the booming Twin Cities food truck landscape. “He has probably built 99.9 percent of the trucks you see out there,” said Scott Pampuch, chef at Fulton Brewing Co. in Minneapolis and a happy customer of Palm’s Minneapolis-based Chameleon Concessions. Pampuch exaggerates, but only slightly. Palm estimates that he’s outfitted several hundred food trucks over the past eight years. It’s a role that he was seemingly born to fill. His professional DNA in the local restaurant supply business reaches back to 1910, with four generations of the Palm family furnishing countless commercial kitchens in Minnesota and beyond. Palm’s first job — post-high school and pre-college — was installing equipment for Palm Brothers in Denny’s, Green Mill, Perkins and Happy Chef outlets. When the family sold the business in 2000, Palm took a piece of it with him and struck out on his own. At the end of his first day as his own boss, Palm closed a $1.5 million contract, and he never stopped. The next decade proved to be ideal on-the-job training, as he designed, built and installed hot dog carts, stands and trailers at hundreds of Home Depot, Lowe’s and Bass Pro Shops stores from coast to coast. Palm’s first food truck customer was Steve Ramlow, who somehow got wind that Palm was trying to unload a well-worn hot dog truck. Ramlow bought it and commissioned Palm to convert it into what was to become one of the metro area’s first food trucks, Simply Steve’s. Palm said that, from the beginning, a big part of his job has been walking an uphill learning curve, a challenge he takes in stride. Chameleon’s client roster swings from the starry (Andrew Zimmern, the Minnesota Twins) and the flashy (a food court at Minneapolis-St. Paul International Airport) to plenty of first-time entrepreneurs eager to break into the dining industry. The creators of O’Cheeze, Green + the Grain, Butcher Salt, Panini Pinups, Hibachi Daruma, the Moral Omnivore and Get Sauced all rolled their trucks out of Chameleon’s workshop. Simple economics dictate that Palm has a booming business on his hands. The barriers are less daunting on the food truck trail because the initial investment falls far below that of a conventional brick-and-mortar restaurant. Palm said that the average cost for a standard-issue food truck with a basic up-to-code kitchen is around $50,000. Palm also rents out trucks, a service for operators interested in test-driving the street-food scene without taking on the costs of ownership. “I’ll apply part of the rental toward the purchase of the truck,” he said. Palm’s animated, noisy and fascinating workplace is what an auto body shop might look like if it were owned by Willy Wonka. It has the controlled chaos feel of an accountant’s office stacked, floor to ceiling, with seemingly random piles of papers. “I know where everything is,” Palm said with a laugh. He leases space, and not nearly enough of it, from neighboring Insight Brewing, in northeast Minneapolis, and every square foot is at a premium. In one corner, a 1950s Ford delivery truck was undergoing its transformation into a waffles-and-coffee operation. Complying with various health, safety and inspection codes is a complicated endeavor. Over the years, he’s forged a network of specialized craftspeople scattered across the metro area: welders in Minneapolis, truck repair specialists in Loretto, electricians in Elk River and plumbers in Buffalo (painting is farmed out to Maaco). They’ve all collaborated for so long that Palm shares keys to his facility, allowing practitioners to work on Chameleon projects around their regularly scheduled commitments. That group also includes his wife, Pam, who manages the business’ books, and their son, Luke, an Iowa State University student who’s spending his summer break dismantling the interiors of old trucks. “I worked with my dad, and now I have the benefit of being able to work with my son,” Palm said. At any given time, there are roughly two dozen trucks on the premises. They arrive from all over. Palm discovers some on Craigslist, and others are routed his way through a long-standing supply chain of suppliers, who keep their eyes open for a sale. Right now, Chameleon’s project list includes a mobile outlet for a vegan restaurant, a kitchen on wheels for a Wisconsin hunting lodge and a movable food-service operation for a nursing home chain. A major undertaking involves retrofitting a veritable Hollywood back lot of vintage vehicles — seven in all, including a 1951 postal delivery truck, a 1940s fire truck and a 1930s Dodge bus — into a hospitality fleet for an out-of-state client. As our society continues to become more mobile, so does Palm’s customer base, branching out from food-service clients. He’s produced on-wheels versions of a fortuneteller’s den, a cellphone repair shop, a treatment facility for a Minneapolis cryotherapy practice, a restaurant equipment showroom and a bicycle-themed youth outreach tool (complete with a basketball hoop) for a community building program created by two Minneapolis school liaison police officers. Still, one of Palm’s more memorable recent projects was retrofitting a gleaming, meticulously restored Airstream travel trailer — a 30-foot beauty from 1968 — into a kitchen that’s parked outside the Fulton taproom in Minneapolis. “One of the big benefits of working with Mark is that he’s a soup-to-nuts guy,” Pampuch said. “You’re not just dealing with a food truck expert, because he’s also such a resource from his personal experience — and his family’s experience — with the restaurant industry. His knowledge is unbelievable.